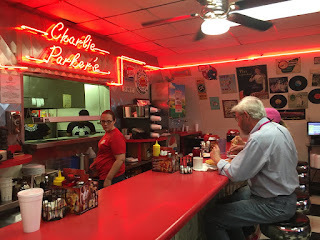 My contact with the visitor's bureau, Maggie, suggested a fun diner for a breakfast or lunch stop called Charlie Parker's, which is a huge draw for good breakfast and lunch grub and has been featured on Guy Fieri's Diners, Drive-Ins and Dives. It turns out that my cousin, the daughter of the aunt who was celebrating her 80th birthday, went to school with the owner, Mike Murphy. And her husband went to school with Murphy's wife. Small world. My cousin told me how good their food was and how big the portions were. 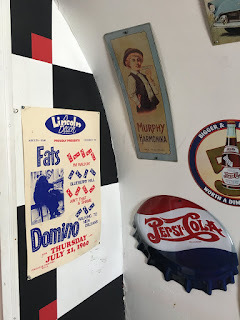 The day after the party, my 13-year-old and I stopped by for lunch. We were greeted by Murphy, who told us a little about the place and gave us a chance to look over the menu. 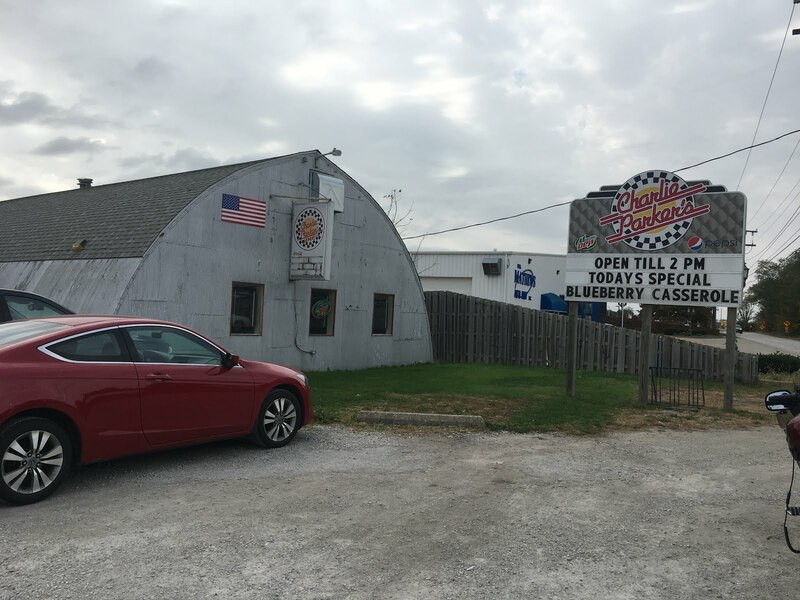 Anyone who has been to restaurants in the Springfield area probably knows that there is a regional specialty there called the "Horseshoe." The open face sandwich starts with usually a piece of Texas Toast, followed by a meat of choice (commonly hamburger, ham, chicken breast or pork, but there are additional choices at Charlie Parker's as well) and then French fries and cheese sauce, sometimes with grilled veggies to finish it off. Most places offer a full "shoe" and then a slightly smaller portioned "pony" shoe. 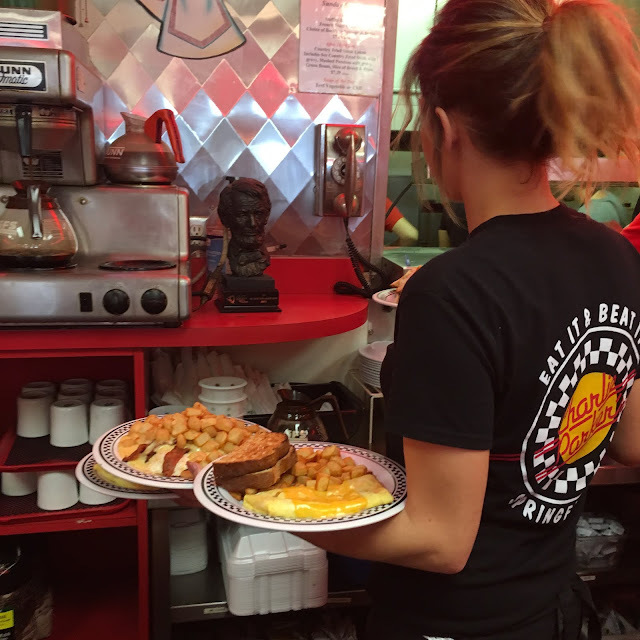 Our innkeeper, Tony Leone, from the Pasfield House Inn suggested that we try the award-winning breakfast shoe. So, we let Murphy know we were interested in that. 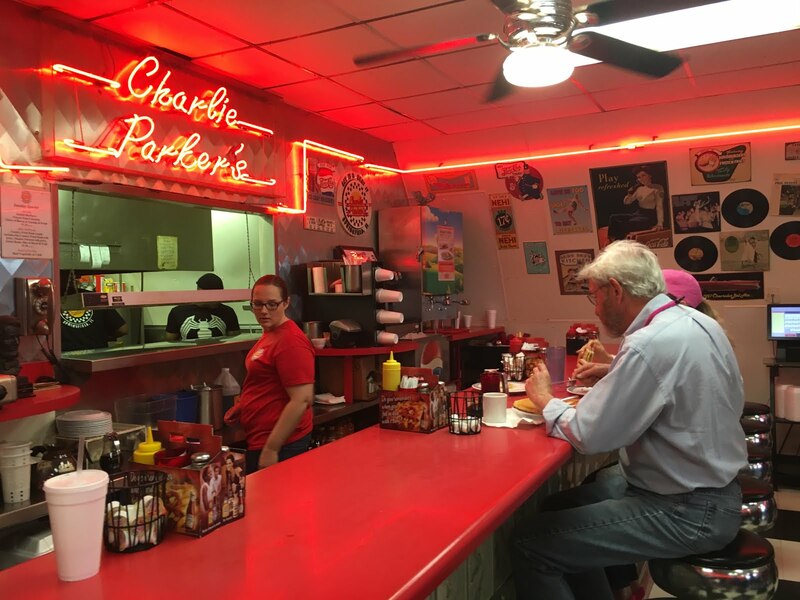 He explained that Charlie Parker's won the title of "Hometown Breakfast Battle National Champion" in the Thomas' English Muffin Hometown Breakfast Battle, which had 135 contestants from restaurants around the country. 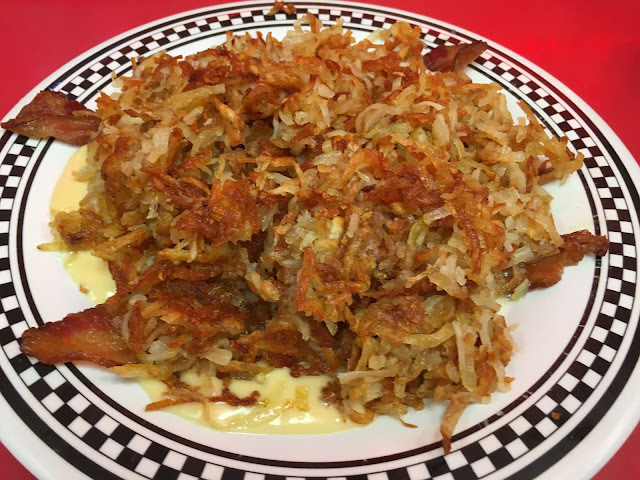 The breakfast horseshoe won top honors. The breakfast shoe can be ordered on toast or English muffin with egg prepared to your preference and then with your choice of meat covered with gravy, cheese sauce or both and topped with hash browns or seasoned American fries. I'm drooling a little just thinking about it. I can see why it was top winner - it's a delicious serving of everything you love in a breakfast all in one. My son and I decided we would share an order. We could have easily both been filled up on one shoe. Then Murphy said he wanted us to try something else. My cousin has mentioned that they had pancakes as big as your plate. Turns out the "regular" pancake is the size of a dinner plate, but there's one even bigger that Murphy whipped up for us. 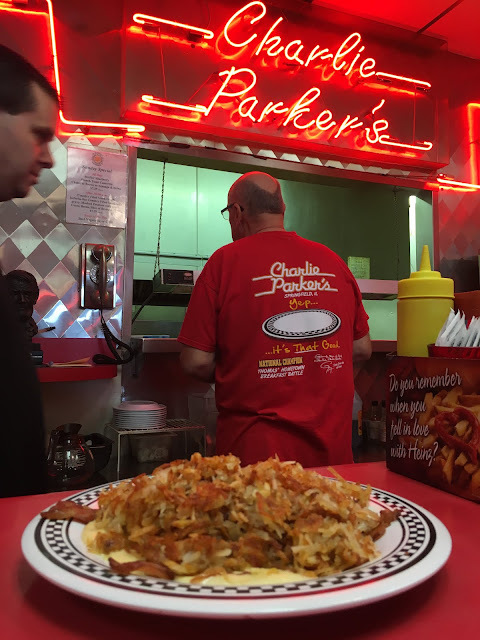 It's Charlie's Famous Giant 16-inch pancake, which is prepared with 24-ounces of pancake batter and served on a pizza pan. I also have to mention that the prices are incredibly reasonable - with the giant pancake just $5.99. Get a side order of bacon and that thing could easily feed three people. 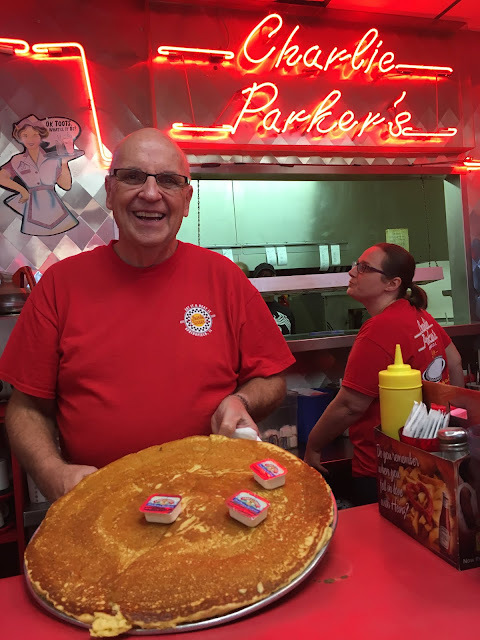 They offer a fun challenge - anyone who orders the four stack of giant 16-inch pancakes ($18.99) and can finish it on their own gets it for free. 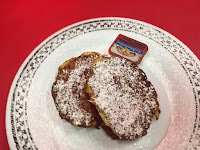 He also brought us a delicious red velvet French toast that was stuffed with cream cheese and more of a dessert than a meal - it was moist and sweet and lightly dusted with powdered sugar. The building itself is also quite unusual. The diner is housed in a quonset hut manufactured during World War II. About 150,000 to 170,000 of the easily portable structures were manufactured during the war. After the war, the U.S. military sold surplus huts to the public for about $1,000 each. The quonset huts were made to be lightweight and inexpensive so that they could be shipped and quickly assembled on bases. This hut made its way to Springfield sometime after the war, serving as a maintenance shed, trucking company, heating and cooling business and bait shop in the years before becoming a restaurant in 1992. 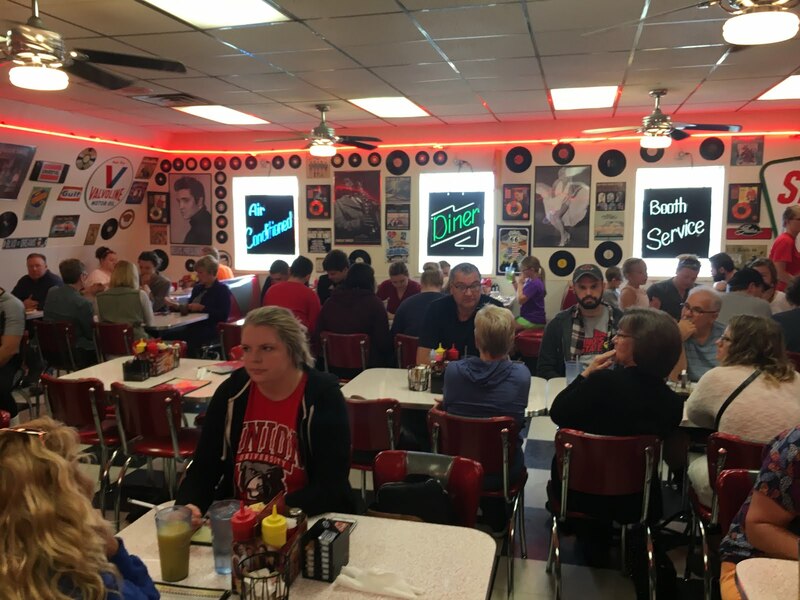 The unique diner has won numerous local and national awards and been featured in various media across the country over the years. 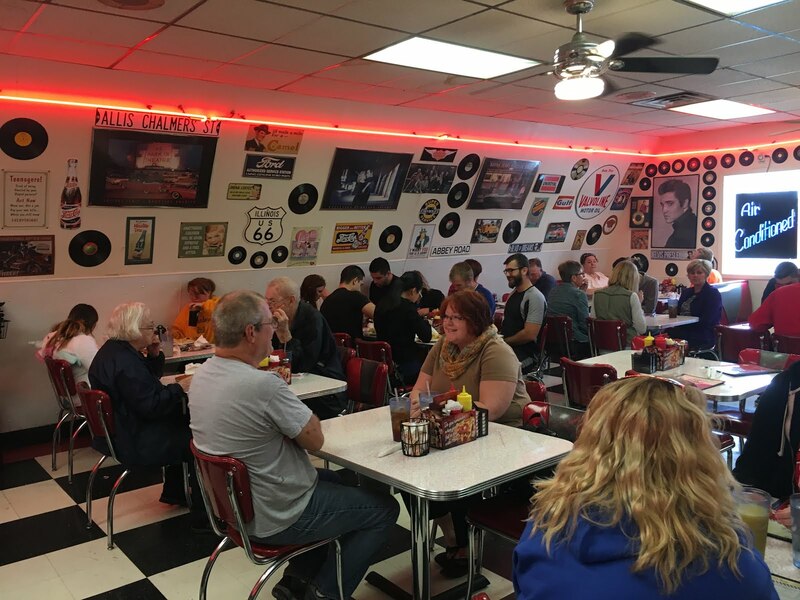 There are also kids meals on the menu, a huge variety of breakfast and lunch items and even an early bird special before 8 a.m. of 2 eggs, meat, potatoes, toast and coffee for $6.79. *I did receive a complimentary meal for the purpose of a review. I was not compensated for this post. All opinions are my own.